This season WOOW have re-invented the CLASSICS, re-interpreted the BIG shapes from the 70s and re-visited TRANSPARENCIES in different ways. 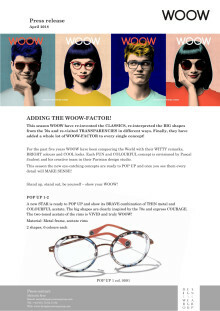 Finally, they have added a whole lot of WOOW-FACTOR to every single concept! A new STAR is ready to POP UP and show its BRAVE combination of THIN metal and COLOURFUL acetate. The big shapes are clearly inspired by the 70s and express COURAGE. The two shapes of this NEW concept will take you straight BACK TO THE 80s. MAKE SENSE is BIG, THIN and COLOURFUL. The combination of transparent and opaque acetates creates a FUN play with light and adds the WOOW-FACTOR to every single design.